I joined ASDA because I wanted to feel more involved and provide students an option for healthy stress relief. kickball because it combined all the classes of the school, DMD and AS. Our friends over at the South End Athletic Company partner up with our Committee for some great events throughout the year. Keep an eye for the next event or stop in their store to check out the newest athletic gear. 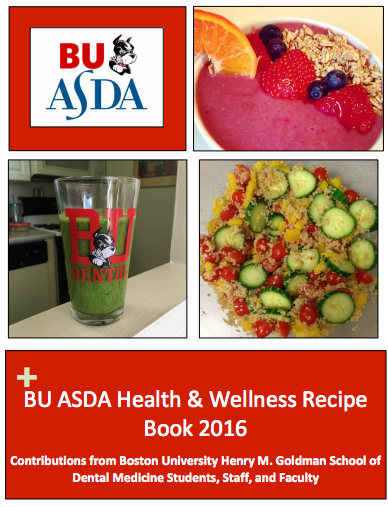 Please see link below to download a copy of our chapter's recipe book! Add oats, nuts, cinnamon and salt to a large bowl. In a separate bowl, combine maple syrup and oil. Whip egg whites until they become foamyn and then add to wet ingredients. Add wet ingredients to oat mixture and mix, making sure all the oats are coated with the liquid. Spread evenly on a baking sheet and bake at 325 for about an hour (until evenly golden brown). Stir mixture while baking at least twice. Once finished baking, let granola cool completely before storing in an airtight container. Note: This recipe is just a general guideline for granola. Honey can be substituted for maple syrup (or a combination of the two may be used), and amount added can be varied depending on desired sweetness. Any type of nut can be added, and dried fruit, dark chocolate, or anything else can be added to granola after baking. 1. Heat 1 tablespoon oil in skillet. 2. Add chicken and cook until done. Remove chicken from skillet and set aside. 3. Add remaining oil to skillet. Sauté onion and garlic until almost tender. 4. Add curry powder and sauté for a couple more minutes. 5. Rinse and add chickpeas, diced tomatoes, and chicken to pan. Simmer for 6-8 minutes until most of the liquid has evaporated. 6. Add spinach and cook until done. 8. Place in tortilla shell and wrap. Enjoy!